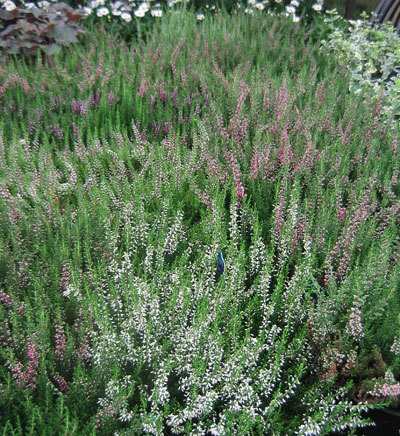 Benefits: Heather was used in past centuries for a variety of things ranging from being a vegetable dye to giving up some of its foliage in the making of malt beer. 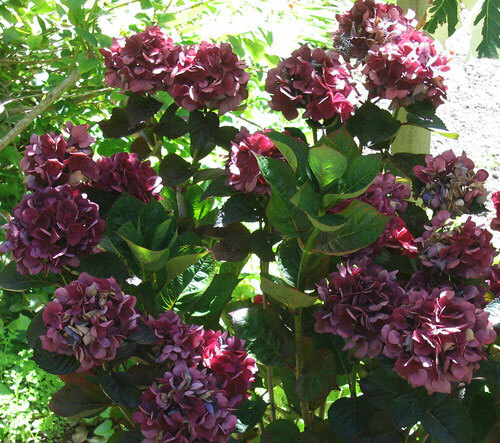 Its claim to fame now is as the perfect plant for acid soils. 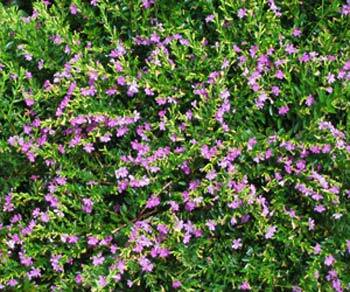 Planting and Care: This perennial heather will grow to be a foot or a foot and a half tall and prefers to grow in full sun in a moist area of the garden. It will do best in acidic soils. This is a very sweet low growing ground cover. Even when it is not in full bloom as you can see in the photograph below on the left, it has an appeal. Photographed: On the left in the Blithewold Garden in Bristol, Rhode Island 2013. Planting and Care: I have only seen this plant growing in the sun in a place where it receives very routine rainfall or watering. However, I have seen it growing in a mountain sub-tropical environment and on the left in New England, which seems a good indication of its adaptability. I have one large plant in my garden now and nearby there are several volunteers. This is definitely a plant I could get behind. If you live in a chilly, not freezing place, expect this plant to look a little sad until the weather warms. 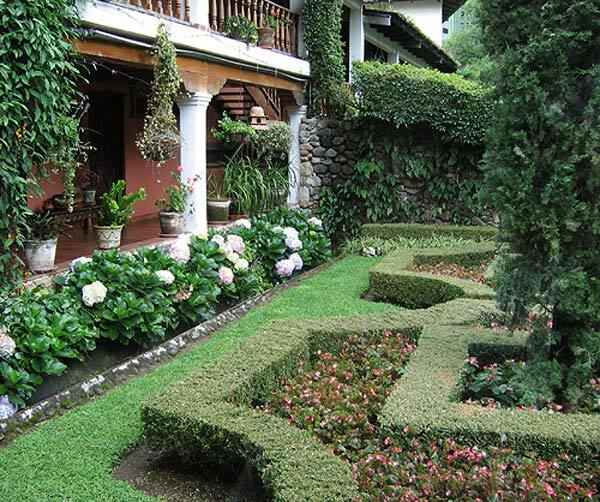 Photographed: In the Botanical Garden at the Hotel Atitlan on Lake Atitlan in Guatemala, 2010. 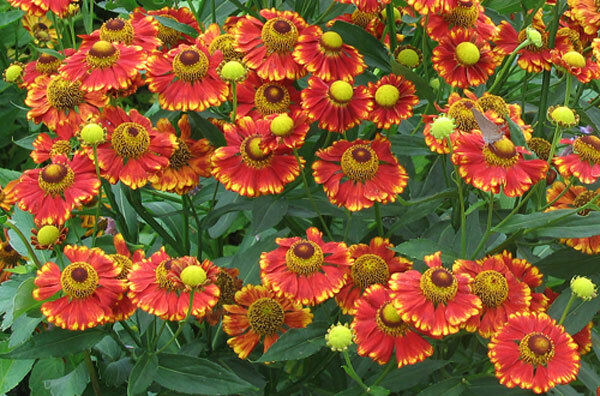 This colorful and distinctive flowering plant is a perennial which makes it even more appealing. It is known to grow to as much as 5 feet in height. 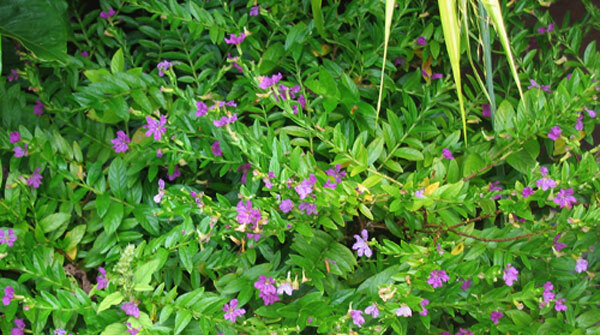 Benefits: Helen's flower has been used to treat colds and headaches as well as being beneficial in treating intestinal worms. 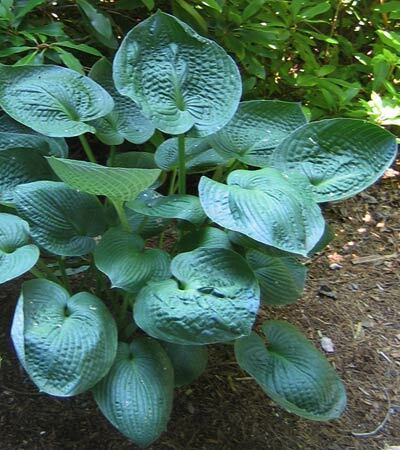 Planting and Care: Plant this beauty where you will want it in the future because it is a perennial. 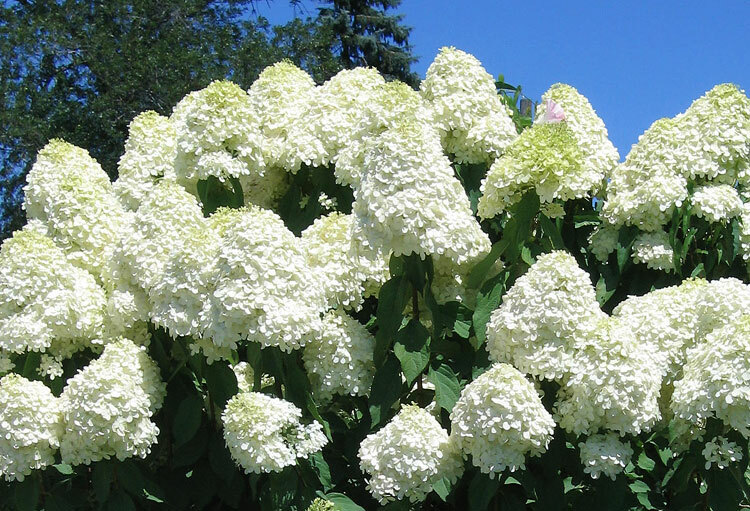 It likes to live in the sun and will be happy with any decent soil that it would prefer to be moist. 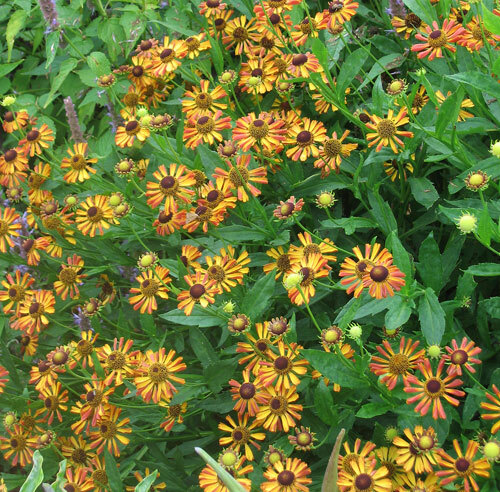 The flowers will begin to appear in August and will continue the show until a real frost puts them to sleep for winter. Benefits: Their charms are immune to foraging deer. From: Southern tropical US most likely. It is mentioned in very old texts including those in Greek so its origins remain something of a mystery. 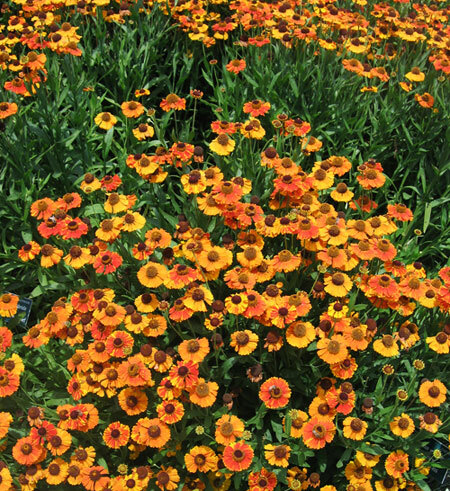 Planting and Care: Growing anywhere from 1 to 4 feet in height, heliotropes are perennials often grown as annuals. They are normally at home in temperate climates, but they will very much enjoy the hot dry summers in warmer climates. Heliotropes flower for a long time, but when a frost arrives it will put all of that to an end. Plant them in good loose soil where they will get full sun for most of the day with shade from the hot sun in the later afternoon. Warning: All parts of this plant are highly toxic. 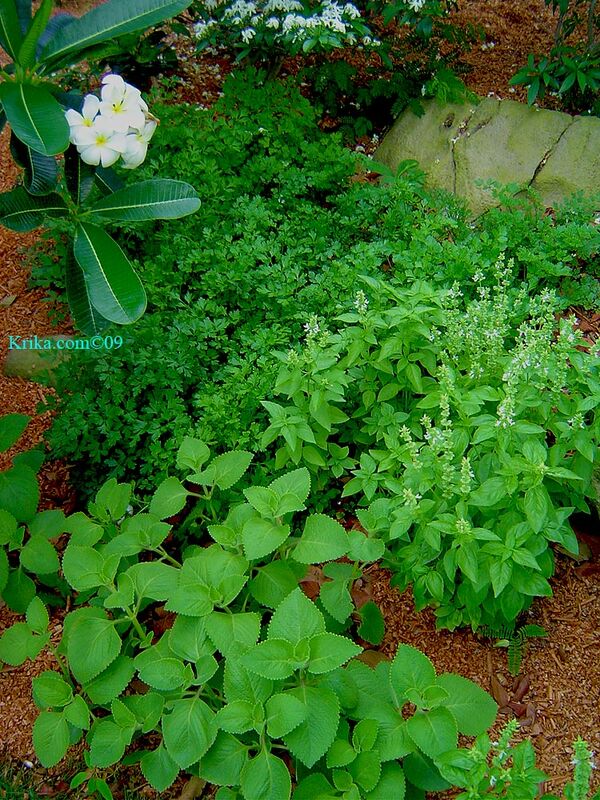 While it is traditional to grow only herbs in a garden like this, I thought it would be more interesting and provide more places on the property for herbs to grow if they were planted intermixed in ornamental garden beds. This garden became a real centerpiece for herbs for a while and though we still called it the "Herb Garden," it took on a more exotic flavor with several varieties of canna lilies and amaryllis planted. Some of the herbs were moved on to other garden beds, but we still had basil, parsley, fitweed (a tropical cilantro alternative), Cuban thyme, lemon grass, chives and rosemary. 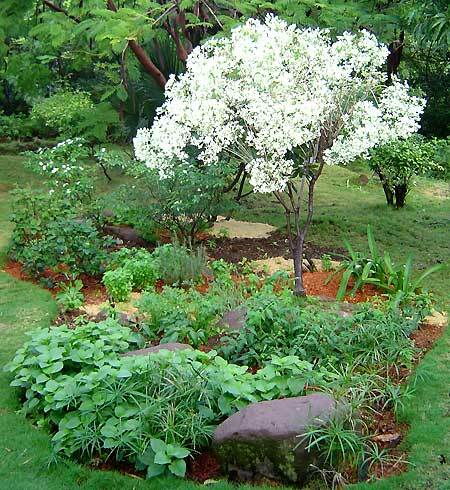 In this lightly shaded part of the Herb Garden in the photograph below we had basil, parsley and Cuban thyme growing underneath the frangipani and pinwheel jasmine. 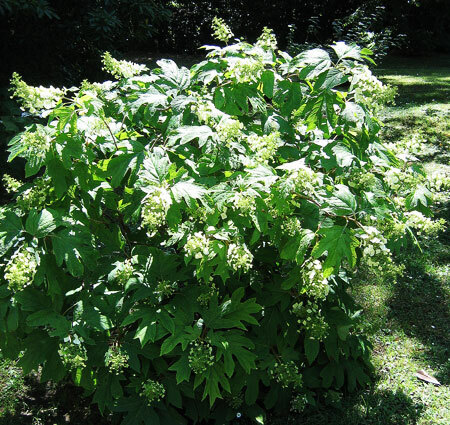 I think this wonderful old standby shrub, benefits from the simplicity of being a deep green with bright red berries. The variegated type in this photograph just seems too busy; you can barely see the red berries. Benefits: This holly will attract both birds and butterflies. Photographed: At our hotel in Calafate, Patagonia, Argentina. 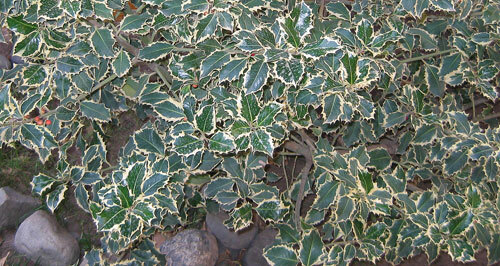 Planting and Care: Plant this holly in full sunlight in moist, well-drained, fertile soil. Surprisingly, this is one of those male and female plants, so plant one of each to get lots of berries. Warning: All parts of this plant are highly toxic to humans. What traditional New England garden doesn't have a hollyhock or two? These are old standbys for good reason and I've now found them growing happily in the Guatemalan highlands in a lovely hotel garden by Lake Atitlan. 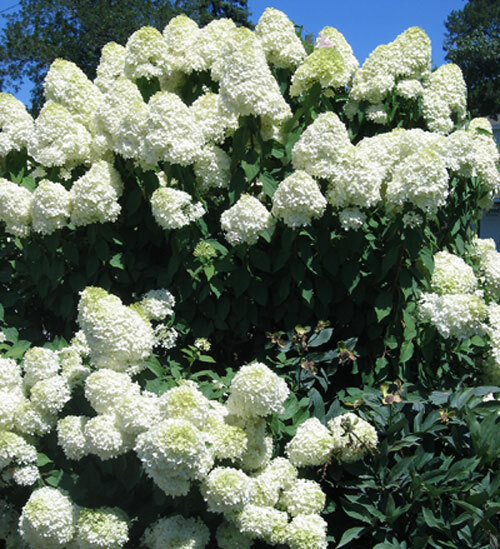 They flower in early summer and reach 5 to 8 feet in height making them excellent background plants. Benefits: Hollyhocks are said to have several curative qualities with such odd companions as bed-wetting and bleeding gums. 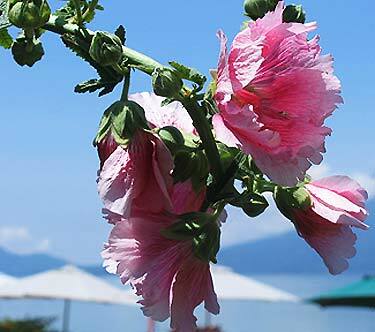 Photographed: In the Botanical Garden of Hotel Atitlan at Lake Atitlan in Guatemala. 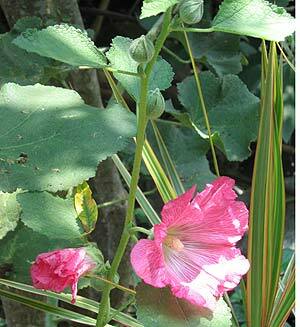 Planting and Care: Hollyhocks are perennials liking full sun and regular rainfall or watering. 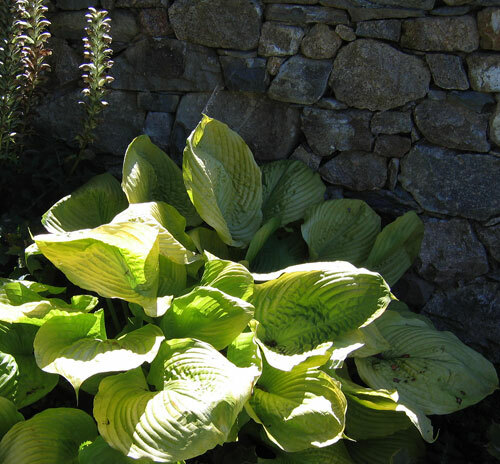 In warmer places they will tolerate some mid-day shade, but always plant them away from windy areas. If you are lucky to live near a well supplied garden shop, buy plants and set them out directly in the garden. If you are less lucky, have a go at planting seeds, but the plants will take two years to bloom making it a biennial. 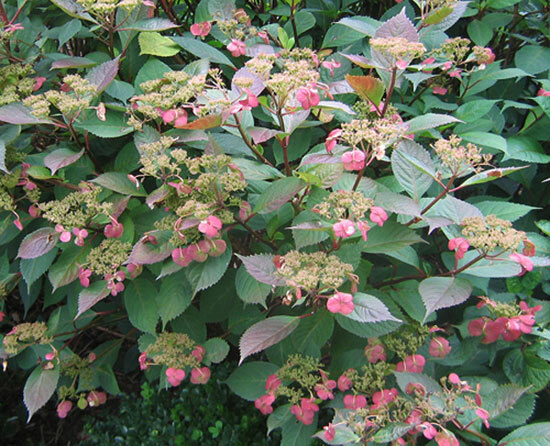 Oddly enough this plant comes with flowers of different colors and each has a soil preference so check with your garden shop or read your seed packet carefully. Aphids and spider mites like hollyhocks as much as we do so consider using rotenone as a control or try a soap spray. 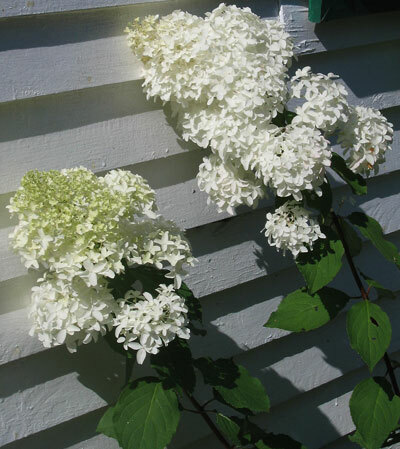 I remember a bush variety of this heavenly smelling plant from my childhood in Rhode Island. I would probably carry one with me every where we go if only I could. 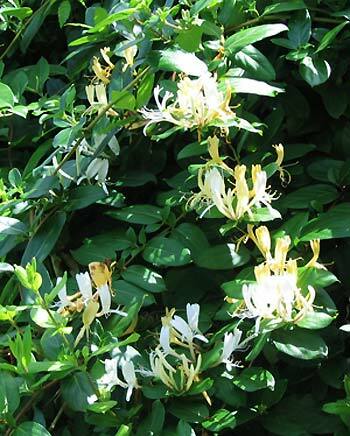 Benefits: This lovely smelling flowering vine attracts butterflies and hummingbirds. 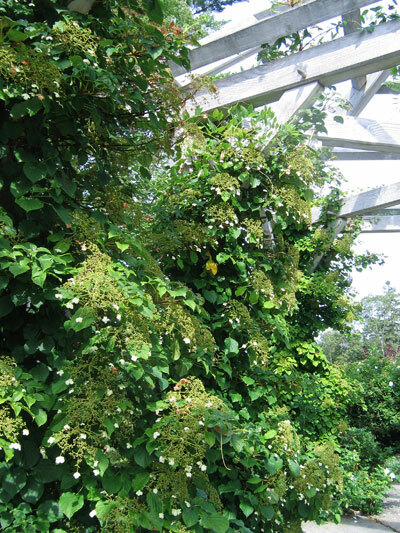 Planting and Growth: This vigorous perennial vine is able to grow up to 30 feet high on a tree or other support. It prefers being in full sun and receiving regular rainfall or watering. This is an essential ingredient in the most popular dipping sauce for cold shrimp and other similar seafood. In a northern garden growing it should be a snap, but in the Caribbean who knows? 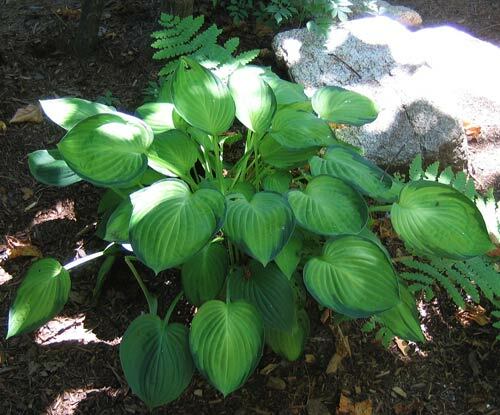 Hostas, with all of the their leaf sizes and colors and their blossoms, make perfect additions to shady areas of the garden. 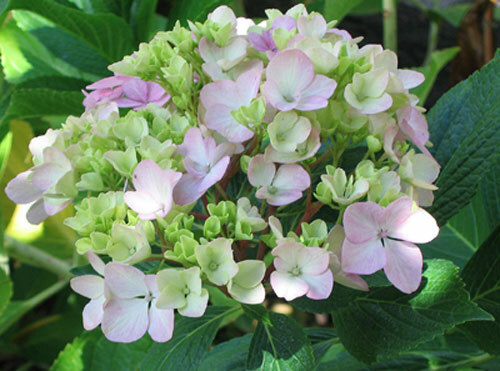 They can be used as background plants or border plants or even centerpiece plants, if carefully done. 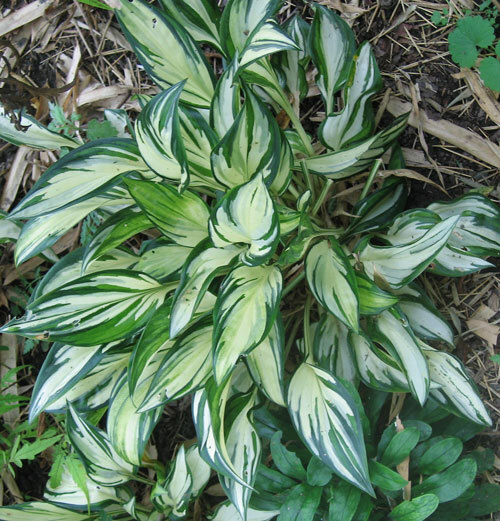 They are easy to care for and live in enough shade where it is often difficult to find other appealing and reliable greenery. I have fond memories of popping the flower buds when I was a little girl, something I now regret. 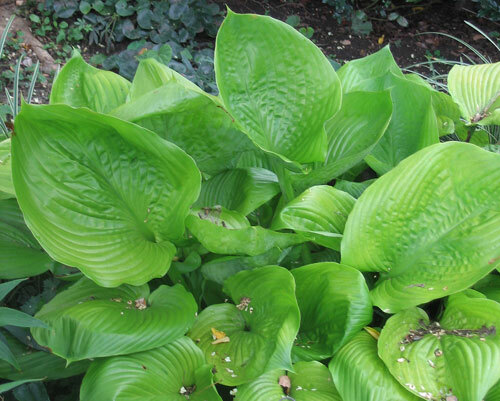 Hosta is a plant I remember well from childhood when I didn't think it was something special -- times change as do attitudes. 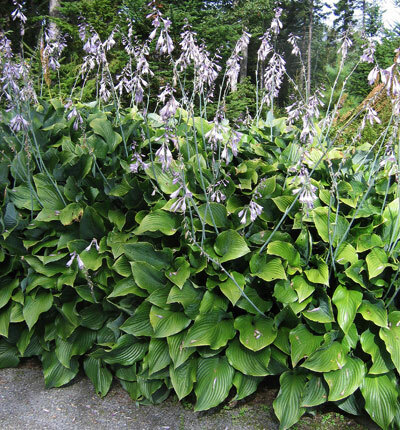 I now rather like hostas and would have them in my shady garden areas if I still had a garden. With advancing global warming it's good to know this plant is heat tolerant. 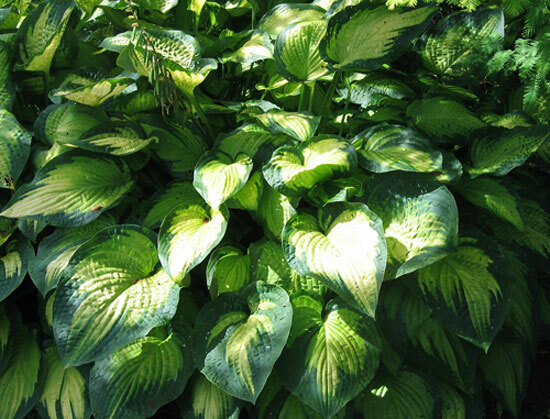 Hostas have become very popular and hundreds of hybrids are now available. Surely one or more of them will win your heart and be perfect for the garden site you have in mind. 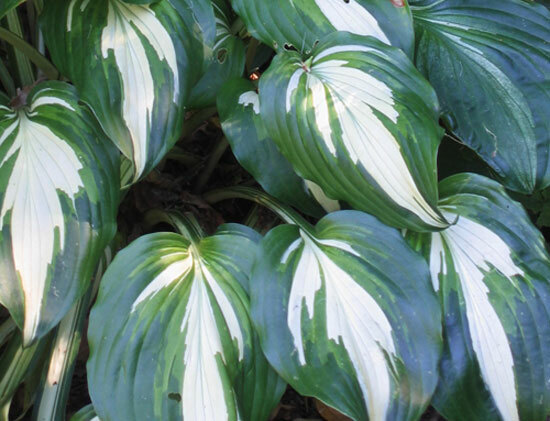 This is a particularly pretty hosta. 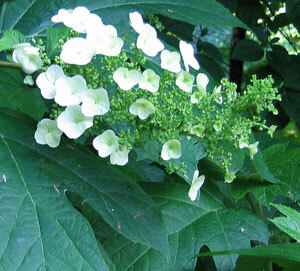 The deep green of its large leaves contrast perfectly with the bright white of its fragrant flowers. As a perennial it will grow to be about 2 feet tall and twice as wide. 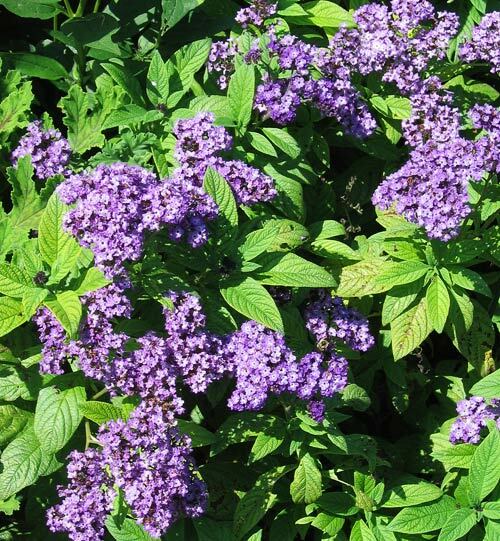 Benefits: The fragrant flowers on this plant bloom in the afternoon and are hummingbird attractants. 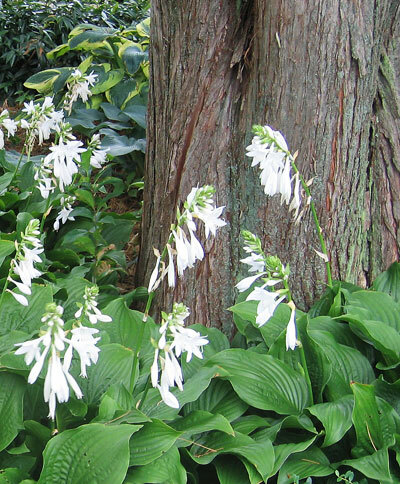 Planting and Care: Hostas are especially easy to care for. 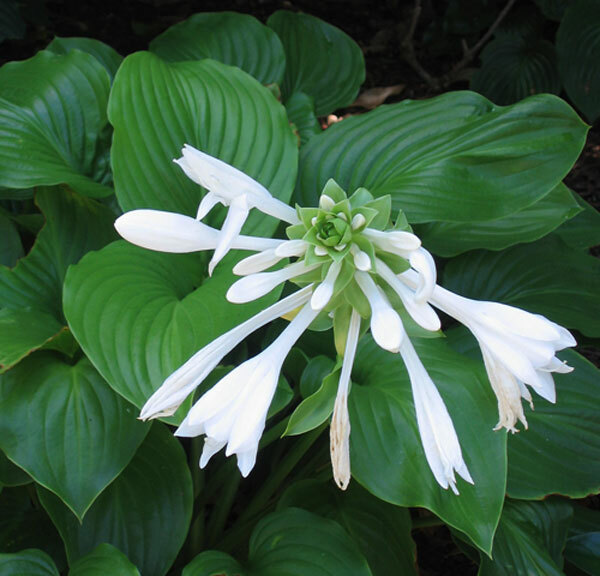 Plant them in bright shady areas even in a cold climate and they will do just fine. They prefer moist, rich, composted soils, but will do well with less. 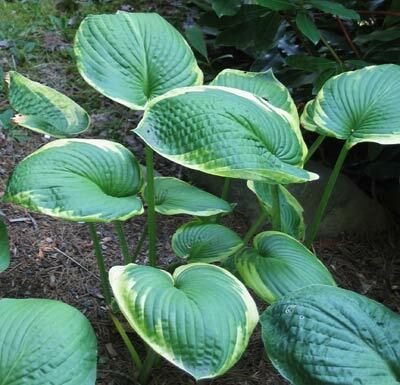 This hosta is considered apple green. 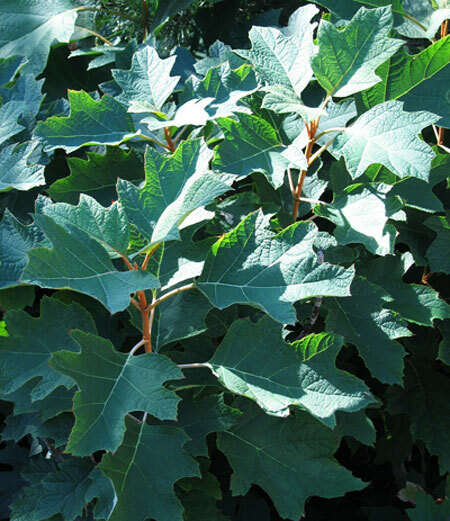 With its large leaves it will be a stand out in any shady garden. 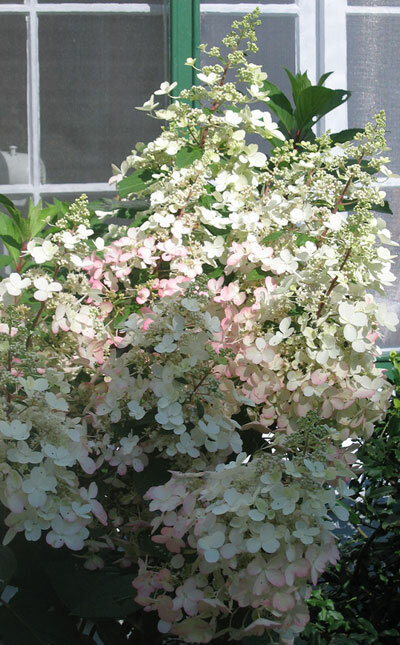 You can expect it to be about 3 feet tall and 6 feet wide giving it the potential for being a shade garden centerpiece. Photographed: Blithewold Mansion, Gardens and Arboretum in Bristol, Rhode Island, in 2013. 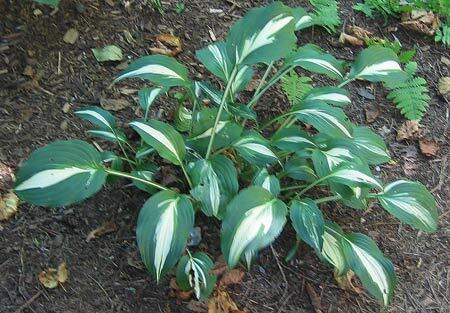 Planting and Care: Unlike most hostas, this one prefers having morning sun along with spending the rest of the day in bright shade. It is also less accommodating in its reluctance to share its composted dirt home with other plants so avoid giving it the kind of competition it would receive if planted beneath a tree. 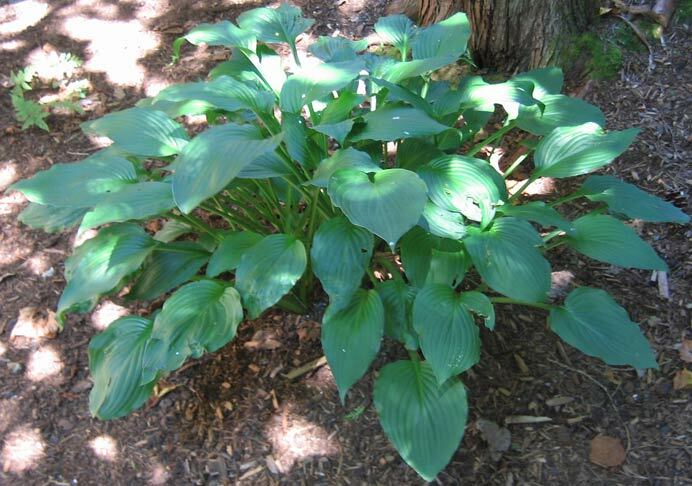 Make sure it has a moist, mulched situation and you will be especially happy with its performance. 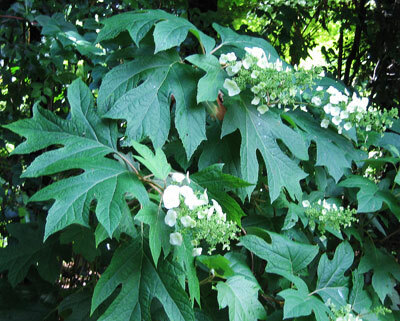 Benefits: It is said that parts of this plant are edible and it seems to be most commonly used for this purpose in Japan. 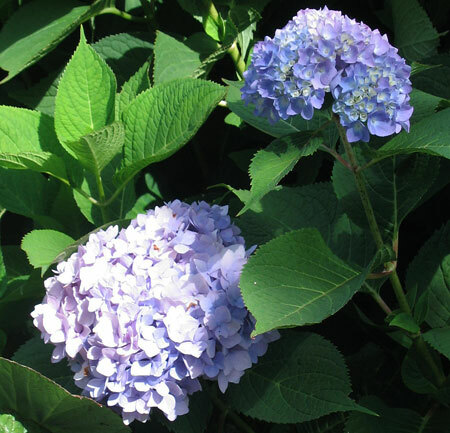 It is also said that hydrangeas are highly poisonous so I would not recommend taking a bite. 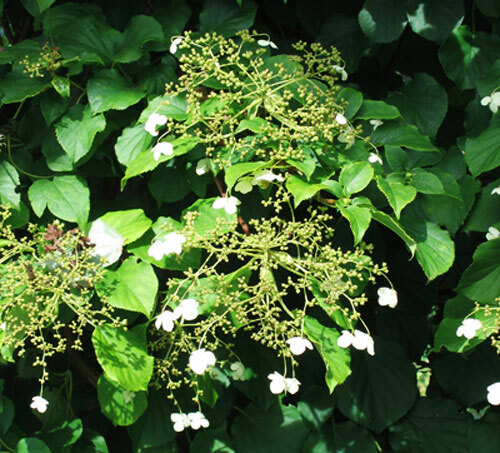 Planting and Care: The climbing hydrangea will grow best in well-drained, moist, rich and fertile soils. 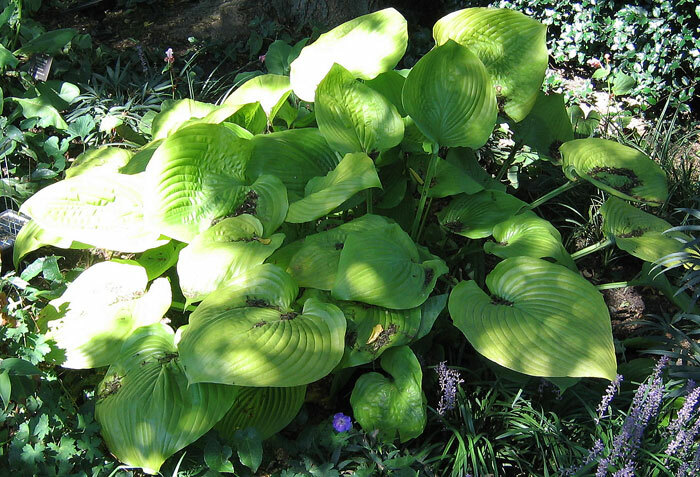 It prefers bright shade or dappled sunlight and will normally not grow well in full sun. It tends to bloom early in the summer season. When it is at its best, it will grow to be almost 40 feet in height. Warning: All parts of this plant are poisonous. Benefits: It has been said that it has medicinal benefits, but since the entire plant is poisonous I find that hard to believe. 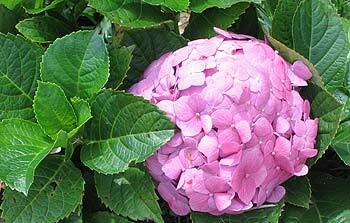 Photographed: In the Coastal Maine Botanical Gardens, Boothbay, Maine, 2013, unless otherwise noted. 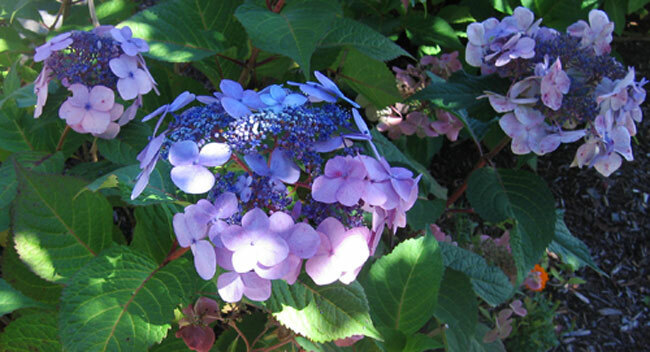 Planting and Care: Morning sun works best for all hydrangeas keeping them free of the hot mid-day and afternoon sun. Plant yours with enough space for it to reach adulthood without pruning. Be sure that it is set in good soil and that it receives enough rainfall or watering to keep the soil moist, not wet. 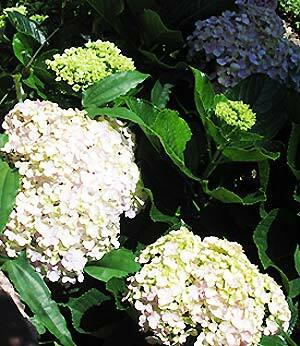 Fertilize these plants in early spring or summer and then sit back and enjoy the show. I remember as a little girl seeing these huge flower covered bushes that seemed even larger than me. We had driven up to Connecticut to visit some distant family. As usual then and now I wandered the garden and was smitten with these beautiful bushes. Years later, my best friend loved them too and my husband and I visited her, planting dozens of them in her garden in the year in which she finally succumbed to cancer. From: One source said Germany, another said Japan. 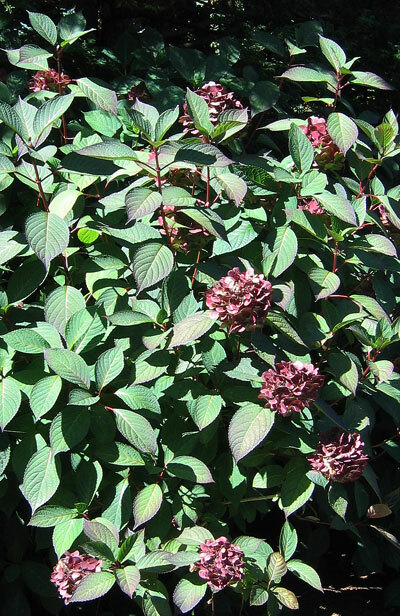 Planting and Growth: This old traditional garden bush loves an acid soil with lots of organic material. 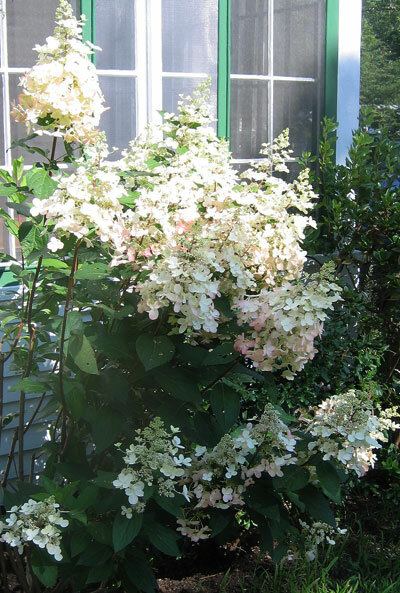 It is perfect for New England gardens because of the acid soil and apparently also for the South as a friend from South Carolina once spoke of the poor country farms there being loaded with hydrangea. 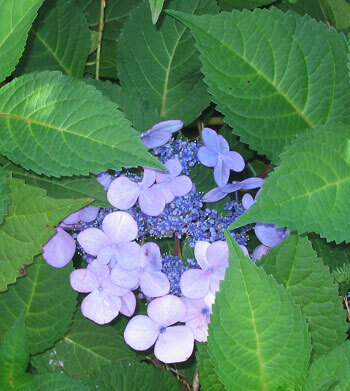 But the South is still the south and she couldn't bring herself to have it in her garden which is a shame because it is a beautiful bush with large showy flowers in blue, purple/blue, pink and white. 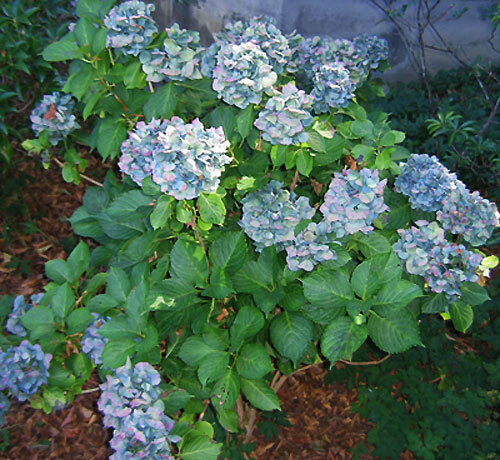 Warning: The entire hydrangea plant is toxic, but especially the flower buds. 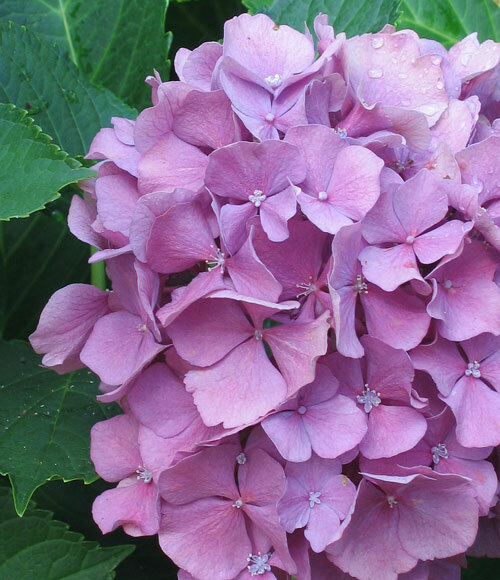 "Swallowing hydrangea is like popping a cyanide pill. The present poison, hydragin, is a cyanogenic glycoside, meaning it will cause shortness of breath, dizziness, fainting, and a rapid pulse, along with a drop in blood pressure that can cause convulsions and death." 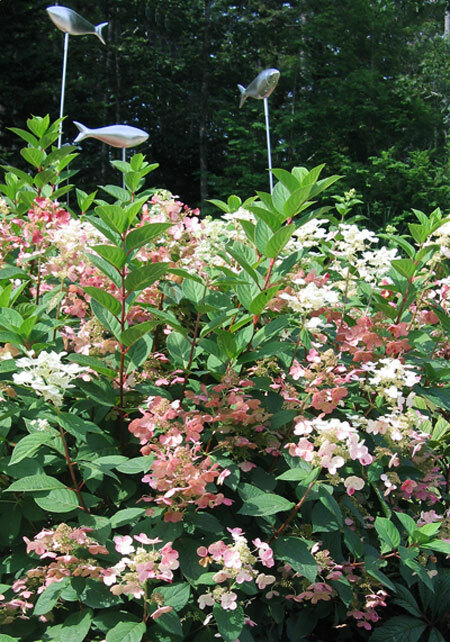 Landscaping with hydrangeas is a terrific idea as you can see in the photograph below where it is used to disguise a foundation. The foliage is lush and beautiful and the flowers are huge and bountiful. 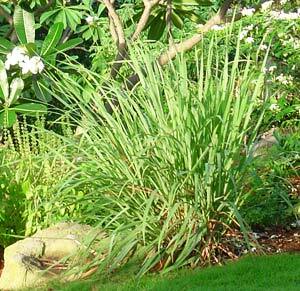 The plants have character, but also make a wonderful backdrop for individual plants that are more exotic in nature. This is a mop head hybrid being about half the size of a normal mop head or about 3 to 4 feet wide and tall. 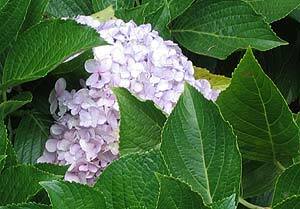 Other than size I find it difficult to distinguish between these two hydrangeas. 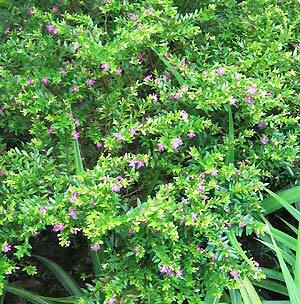 It will normally begin blooming in July and will do so through September. Benefits: None mentioned except that it is a prolific bloomer. From: This is a hybrid. 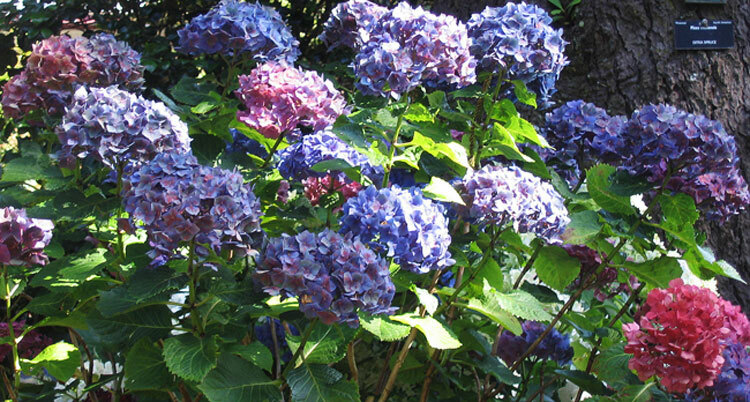 Planting and Care: Plant this hydrangea where it will not normally receive hot afternoon sun and give it watering or rainfall that is normal in your area and it should do just fine. Photographed: Blithewold Mansion, Gardens and Arboretum in Bristol, Rhode Island, USA in 2014. 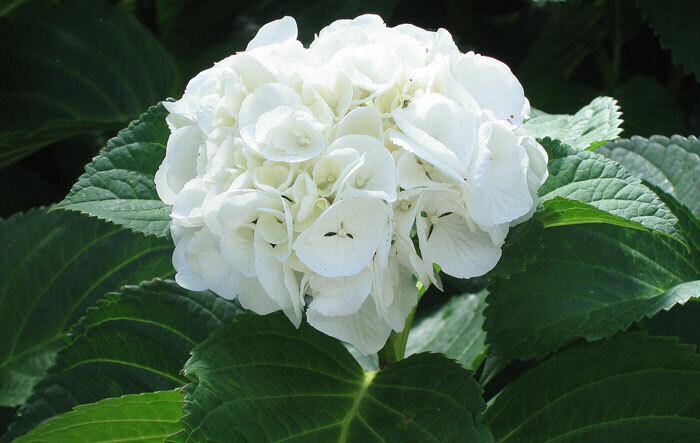 This is a white flowering hydrangea with oak tree shaped leaves as you can see in the photographs. Benefits: It does not appear to have any significant medicinal benefits. 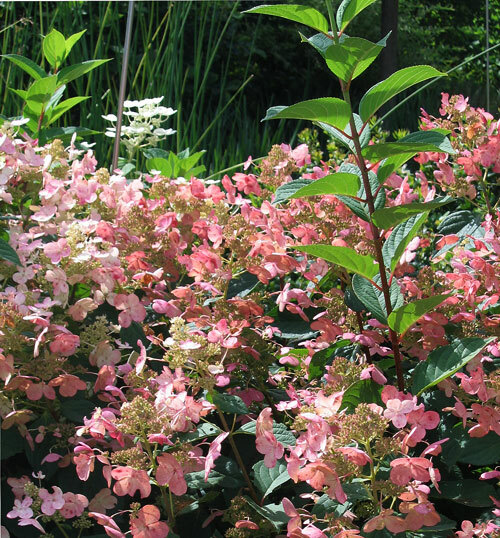 Planting and care: This beautiful drought resistant bush prefers to grow in partial to full shade in a slightly acid soil if possible. It is also said to be drought resistant though in such dry conditions it will not normally bloom. 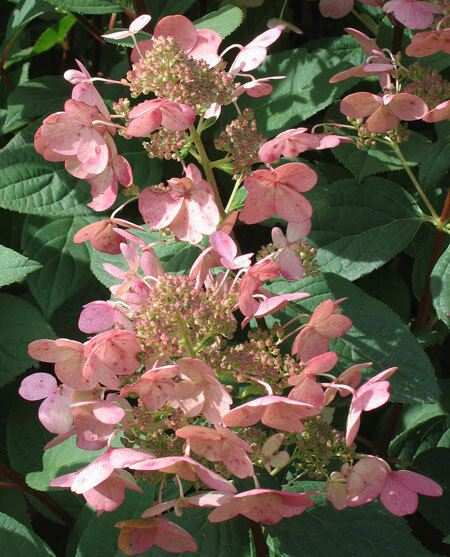 Panicle hydrangeas are distinguished largely by the shape of their flowers. Unlike the smooth round mop-head, panicles have a conical flower shape. Within the panicle family there are a variety of flower types as you may see in the photographs below. 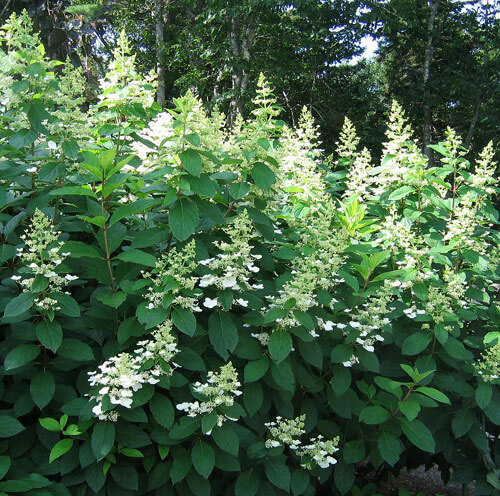 Planting and Care: When well settled you may expect this plant to grow from about 15 to 30 feet tall. 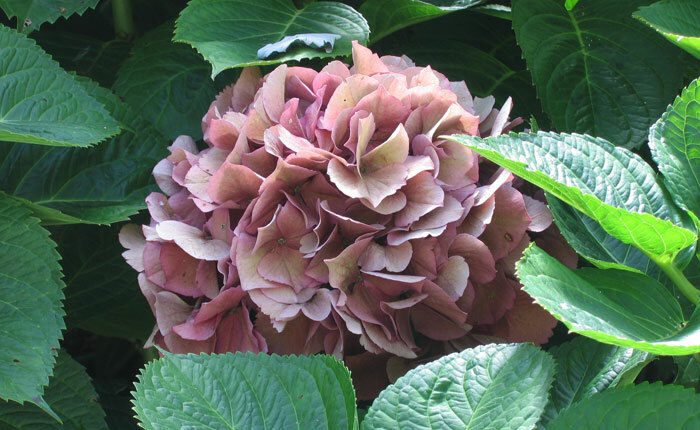 It is said to be extremely tolerant and hardy and it will handle more direct sun than most other hydrangeas. Plant it in good soil and ensure that it has sufficient moisture and you won't be disappointed with its performance. 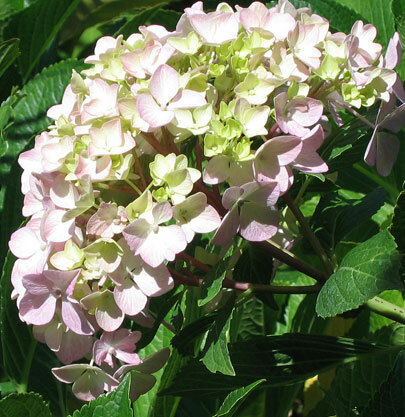 Its flowers are white moving towards pink as they age.